As you know, Sanuki Udon is very popular. Sanuki means Kagawa-prefecture. Udon of Okayama is also delicious. 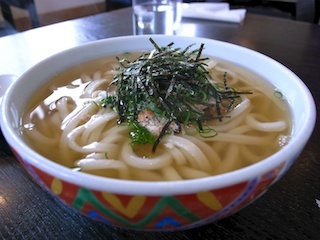 People of Okayama often have Udon. I have Udon for lunch once or twice a week. My favorite Udon restaurant is "TAKATO UDON". Today's Udon is "Natto Udon". The balance between Natto and Dashi is very good. Of course, softness of white wheat noodle is best.